I. Introduction and an Overview. 1. Natural resources - definitions and classifications. 2. The role of natural resources and their uniqueness. 3. The availability and uses of mineral and energy resources. II. Utilization of Mineral Resources. 4. Resource scarcity and resource conservation. 5. Economic feasibility studies in mineral and energy industries. 6. Optimal recovery design for a depletable mineral deposit. 7. Societal vs. private interest economic evaluation. III. Current Issues in Mineral Economics. 8. Industrial organization in the mineral industries. 9. Location and spatial aspects of extractive activities. 10. International investment and trade in mineral materials and products. 11. Mineral production and the environment. IV. Case Study and Appendices. 12. Optimizing a depletable mine design, Rio Blanco latiritic nickel deposit. Appendices. Although profitable development and exploitation of natural resources has been, and still remains, the goal of many individuals and firms within the extractive industries, several new goals must also be considered, the foremost of which is the wise management of the already discovered stocks of renewable and nonrenewable natural resources. This aspect has become of vital importance for society as a whole. It is this dual objective - the economic feasibility on behalf of private interests, and the efficient development and utilization of natural resources as viewed from the societal point of view - that is covered in this book. The material presented is based on many published and unpublished sources, and serves to demonstrate the basic principles associated with the economics and management of mineral resources. Rather than attempting to carry on an in-depth analysis of the various topics, the author has provided a broad coverage of the basic concepts and their applications in real-life occurrences. For those interested in more intensive analysis, suggested additional selected readings and references are provided. The book is written as an introductory-level textbook in mineral economics. Advanced students in mineral engineering programs, economics, and business administration curricula, with a particular interest in economic analysis of mineral and energy activities may find this book an appropriate starting-point. 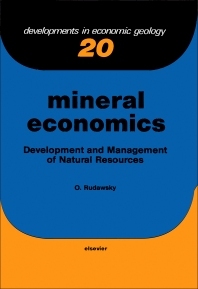 Likewise, first-year graduate students in engineering programs, resource economics, mineral economics, natural resource management, environmental sciences, and law will find that the book provides a fundamental understanding of the basic concepts of mineral economics and how they relate to the general economic and management theories.